Paul mentions in his letters several persons who were part of his life and that appear in Acts but he nowhere indicates that he ever owed his conversion to the events initiated by the martyrdom of Stephen — a martyrdom that he reportedly witnessed as an accomplice. Clement of Rome and Polycarp wrote of Christian martyrs but appear to have never heard of Stephen. 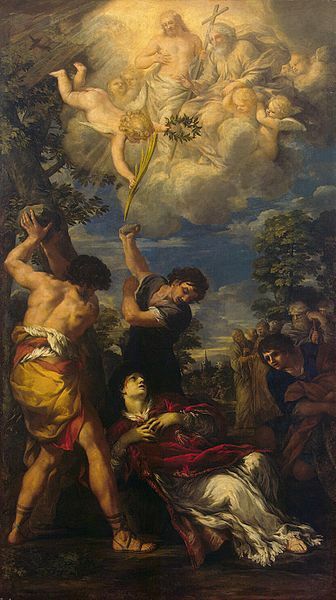 If Stephen’s martyrdom had indeed been the first, and if indeed it had been the spark that initiated such a significant train of events as the expansion of Christianity and the conversion of an accessory to Stephen’s lynch mob, Paul, this silence is indeed unexpected and does cry out for an explanation. For example, the consensus (Matthews herself points out that it is the consensus) is that the historical reasons Stephen was killed had to do with some form of accusation that he provocatively attacked the law and temple. But why select that element as “bedrock”, Matthews asks. Surely it is just as reasonable to imagine the author himself creating those charges against Stephen in order to make Stephen appear to be walking more closely in the footsteps of Jesus. Jesus, recall, was subject to those same charges in the Gospels. 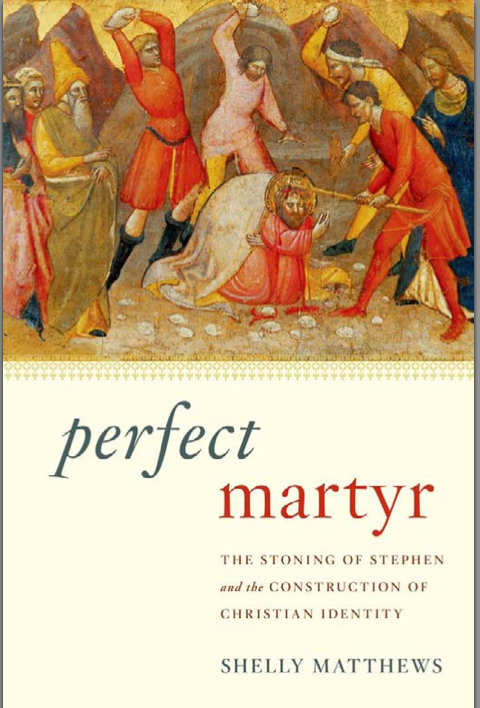 We also have the most happy coincidence that the name of the first martyr, Stephen, means “Crown” — the very reward for those who die for Christ. Given Luke’s love of symbolic names we may well be suspicious that this character is another construction of his — the paradigm of the Christian martyr. Or suppose Luke saw the name, Stephen, in a source. How could we know if Luke was not inspired to write a story of martyrdom as a result of his being attracted by the potential meaning of the name? There are other internal clues that are not directly addressed by Shelly Matthews as such. Verisimilitude indeed for an anti-Semitic author and audience — a bigotry more typically found in the second century than the first. Another detail commonly noticed is the contradiction found following Stephen’s stoning: the church as a whole being is so severely persecuted that it must scatter beyond to new territory, yet the twelve leaders remain curiously untouched and able to continue unmolested in Jerusalem. We may well ask, Did Stephen’s death really spark a wider persecution and scattering of the church or didn’t it? If Luke did create Stephen and his martyrdom, why did he do so? How does Stephen function rhetorically in the narrative of Acts? Here we edge closer to Shelly Matthew’s special interest. She spells out in detail the various ways in which Stephen is such a perfect rhetorical fit in the larger narrative. I am sure many readers will have sensed some of these points for themselves as they have pondered on the text. Stephen stands as a pivot or gateway between the time of Jesus and the Jerusalem apostles and the broader mission of the church to the Gentiles led by Paul. He emerges in the midst of a conflict between two Jewish groups, Hebrews and Hellenists; compare Paul being at the centre of conflict between Jewish and Gentile believers. Just as the Jerusalem apostles were confronted by the temple leaders and as Paul faced hostile synagogues, Stephen first faces controversy in the synagogue and is subsequently tried by the Sanhedrin and high priest. The seven names in the list in which he first appears (Acts 6:5) conform to the larger plot-line of Acts: beginning with Stephen to the Greek speaking Jews and concluding with the evangelization of Gentiles at Antioch. The opponents of Stephen come from far and wide: Cyrenians, Alexandrians, and of those of Cilicia and Asia. The first in this list can be either Libyans or “Libertines”. Either this extends the geographic extent of his opponents or signifies that it crossed class boundaries as well. Compare Paul facing the opposition of peoples as far as “the ends of the earth”. Before the death of Stephen the history of the church centred upon Jerusalem; following his death we follow the action into Judea, Samaria and the “ends of the earth”. His death marked the beginning of the fulfilment of Jesus’ prophecy (1:8) that the disciples were to spread out through Samaria and the rest of the world; as a direct consequence of his death persecution fanned to the rest of the church; and that led to the scattering of the believers; and that in turn led to the wider proclamation of the gospel. After Stephen we move out from Jerusalem and find Philip preaching in Samaria, Paul being converted, Peter on a mission into Lydda, Joppa and Caesarea, and unnamed disciples converting people in Antioch — where the term Christian was coined to describe them. One vital function of the Stephen episode is the way it serves to establish the clear distinction between Jews and Christians. Stephen is in the same line of persecuted prophets as was Jesus, and as began with the martyrdom of Zechariah. In Luke 11 Jesus made Zechariah’s role (the one killed between the altar and the temple) paradigmatic. Stephen also fulfills the Deuteronomic pattern — that is, Israel kills the prophets and then suffers as a consequence — just as do Jesus before him and Paul after him. note how Paul is explicitly linked to Stephen twice, once at his martyrdom and again in his speech from the temple steps. Stephen also functions to undermine the Jewish juridical process, an important theme for Luke who more generally seeks to show respect for Roman authorities while denigrating the Jewish ones as barbaric by contrast. Forgive them, Father . . . Absent from the above list is the notice that Stephen repeated Jesus’ famous words calling for forgiveness upon the Jews. Shelly Matthews chooses to devote the final chapter to a discussion of this detail. It is not as innocent or noble a prayer as the author wants us to believe. Matthew’s interprets the prayer as ultimately serving a most pernicious function. It sets Christians apart as the ultimate in godly perfection, all-merciful and gracious even towards enemies. That is, it sets them apart from the Jews who are depicted as hard-hearted, implacable, without excuse any more (they had since learned that Jesus was resurrected and seen the signs of the miracles, so they were really without excuse by now), and incapable of being forgiven. Forgiveness of the Jews requires the repentance of the Jews. That message has been made clear up till now in Acts. While Luke places such a perfect prayer for a perfect saint in the mouth of the ideal Christian martyr, in his narrative presentation he leaves no room for forgiveness (or repentance) of the Jews. They have closed their ears to Stephen and want him dead when he proclaims his vision of Jesus Christ in heaven. There is a clear disconnect between the way the merciful prayer epitomizes Christians as saintly and the way the Jews are portrayed as wicked killers who even hate the very thought of what is required to be forgiven. The prayer has served to entrench respective stereotypes of Christians and Jews, or more specifically, it has served to draw a sharp distinction between morally superior Christians and degenerate, murderous Jews. So Stephen’s prayer does serve one of Luke’s core ideological agendas, though not a particularly noble one by our standards. So we have good reasons for questioning whether Luke based his narrative on a real event. We certainly see very good reasons why he might have wanted to create the scene just the way it appears. It very happily fulfills several rhetorical and ideological agendas of the author. Was it coincidentally historical, too? In a follow up post I’ll discuss Shelly Matthew’s postmodernist historiographical approach and historical critical method more generally. We will see how both open up entirely new insights into the nature of what biblical scholars have long considered their “primary evidence” for Christian origins and also into how genuine historical criticism, consistently applied, can expose the ideological and cultural assumptions that currently control their interpretations and assumptions. Posted on 2013-11-26 10:53:52 GMT+0000 by Neil Godfrey. This entry was posted in Biblical Studies and tagged Luke, Luke-Acts, Matthews: Perfect Martyr, Shelly Matthews, Stephen. Bookmark the permalink. Small biblioblogging world. Shelly Matthews worked at Furman for many years. I had a brief discussion or two with her in the lunch room, and was at one of her Christmas partiesyears ago. I’ve skimmed her book, but you summed it up neatly and concisely..
3and said unto him, Get thee out of thy land, and from thy kindred, and come into the land which I shall show thee. 5 and he gave him none inheritance in it, no, not so much as to set his foot on: and he promised that he would give it to him in possession, and to his seed after him, when as yet he had no child. 10 and delivered him out of all his afflictions, and gave him favor and wisdom before Pharaoh king of Egypt; and he made him governor over Egypt and all his house. 16 and they were carried over unto Shechem, and laid in the tomb that Abraham bought for a price in silver of the sons of Hamor in Shechem. 18 till there arose another king over Egypt, who knew not Joseph. 25 and he supposed that his brethren understood that God by his hand was giving them deliverance; but they understood not. 32 I am the God of thy fathers, the God of Abraham, and of Isaac, and of Jacob. And Moses trembled, and durst not behold. 36 This man led them forth, having wrought wonders and signs in Egypt, and in the Red Sea, and exalted the people when they dwelt as strangers in the land of Egypt, and with an uplifted arm He brought them out of it. 44 “Our fathers had the tabernacle of witness in the wilderness, as He appointed, instructing Moses to make it according to the pattern that he had seen, 18 Now for a time of about forty years He put up with their ways in the wilderness. 49 The heaven is my throne, And the earth the footstool of my feet: What manner of house will ye build me? saith the Lord: Or what is the place of my rest? .28 And though they found no cause for death in Him, they asked Pilate that He should be put to death. Yes, thank you! I’m glad it’s not just an armchair scholar who’s made a name for himself has figured this out. Seeing the two anti-Judaic lectures side-by-side really does demonstrate, to me at least, that the two came from the original common speech. Just exactly who that speech was originally attributed to is quite the mystery, and Luke hasn’t told us. I sometimes wonder whether the materials from which the author of Acts created his story were the various versions of Paul that were circulating among mid-second century Christians. In this scenario the John who is repeatedly paired with Peter early in Acts (3:1; 3:11; 4:13; 4:18; 8:14) would be a sanitized nod to the Johannine(/Apellean?) version of Paul (see my post Was Paul the Beloved Disciple?). 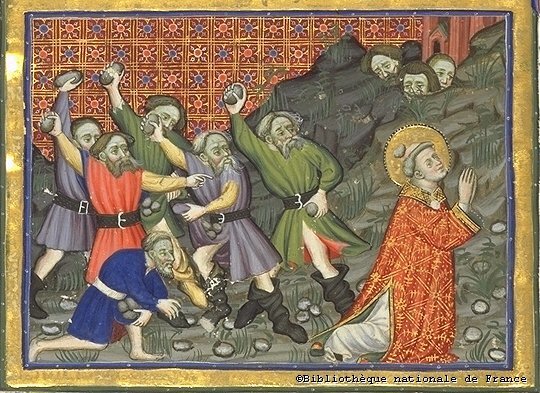 And if so, the martyrdom of Stephen, the “crowned one,” could reflect how Johannine/Apellean Christians believed their Beloved Disciple had ended his days. I am just speculating, of course, for the extant record doesn’t give us information about that part of their belief. But the promise to “Nathanael” in Jn. 1:51 (that he will “see the heavens opened and the angels of God ascending and descending on the Son of Man”) never gets fulfilled in the Fourth Gospel. So I have wondered whether the portrayal of the crowned one in Acts 7:56 who, as he dies, sees “the heavens opened and the Son of Man standing at the right hand of God” could reflect Johannine belief about its fulfillment. It is generally held that Paul really only comes into the Acts story in chapter 9 (though he get a fleeting reference as Saul in 8:1) and that he is the central character only from that point on. But various characters in the early chapters (Peter’s companion John, Stephen, and Simon of Samaria) may be reworked and sanitized Pauline material. If so, the whole of Acts in effect is about one man. My vote for who the original figure was goes to Simon. The more complex and fluent the “rhetorical fittingness” of the Stephen episode within the larger narrative the less likely, I would think, do its details owe anything to a reality that fortuitously lent itself to such a literary and thematic fluency and the more likely they originate in the creative mind of the author. Yes, for the reasons you mention the Stephen episode could have been the creation in toto of the author of Acts. But since there is a good chance that for most of his work he creatively used sources (the Pauline letters), he may have used a source too for the crowned one’s martyrdom. And many scholars are even more convinced that is the case for the crowned one’s speech. It is just too unlike the typical speeches the author puts in the mouths of Peter and Paul throughout Acts. Just to be clear, I don’t think the episode reflects a particular historical martyrdom. I think it may reflect (and rework) the belief of a particular second century community about a purported martyrdom. Another possible provenance for the account of the crowned one’s martyrdom could be the second century Helenians. Celsus said the Helenians reverenced as their teacher Helen—the Helen who, according to Simon, was the Wisdom of God and his Holy Spirit. In the Acts of the Apostles the crowned one is selected when “the HELLENISTS complained against the Hebrews because their widows were being neglected in the daily distribution” (6:1, my caps). He was selected from among those “filled with wisdom and the Spirit” (6:3) and his opponents “could not withstand the wisdom and the Spirit with which he spoke” (6:10). He reproaches the Jews with: “You always oppose the Holy Spirit.” And when he sees the heavens opened he is “filled with the Holy Spirit.” These may be clues to the provenance . Pingback: Vridar » Is the Criterion of Embarrassment an Embarrassment?